As the young created new styles in music, fashion and culture, pulp fiction followed their every step, hyping and exploiting their behavior and language for mass consumption. From the juvenile delinquent gangs of the early fifties, through the beats and hippies, on to bikers, skinheads and punks, pulp fiction left no trend untouched. Boasting wild covers and action-packed plots, these books reveal as much about society s desires and fears as they do about the subcultures themselves. 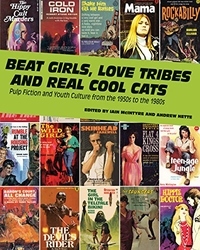 Featuring over 300 pulp covers, many never before reprinted, as well 70 in-depth author interviews and biographies, articles and reviews, Beat Girls offers the most extensive survey of the era s mass market pulp fiction. Novels by well-known authors like Harlan Ellison, Lawrence Block, Evan Hunter/Ed McBain, and by filmmakers Samuel Fuller and Ed Wood Jr., are discussed alongside neglected obscurities and contemporary bestsellers ripe for rediscovery. More than 20 critics and scholars of popular culture contributed to this celebration of a fascinating body of work. Contributors include Mike Stax, Alwyn W. Turner, Stewart Home, Bill Osgerby, Clinton Walker, and Nicholas Tredell."